After serving in the Confederacy, James Remely Brumby, a native of Benton, MS, with a helper named Washington, establishes a tannery and begins making flower barrels by hand on Powder Springs and Goss streets near the Confederate cemetery. 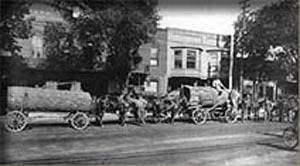 Tannery flounders but barrel manufacturing grows into the Marietta Barrel Factory to supply flour mills in Marietta, Macon and Augusta. 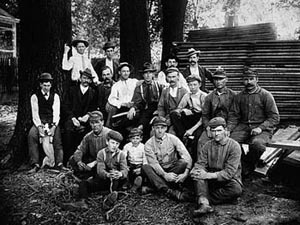 James Remley Brumby, after purchasing a lathe on the Courthouse steps at a sheriff's sale of $25 and starts experimenting in chair making. Chairs become the most important product of this combined cooperage, tannery and chair factory as burlap sacks begin replacing wooden barrels for storing and shipping flower. 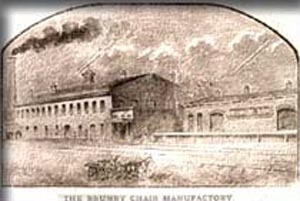 James Remely Brumby and his younger brother Thomas M. Brumby establish Brumby and Brother and manufactures the first Brumby Chair. 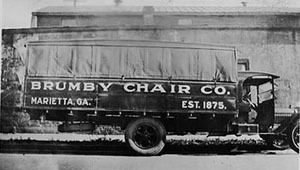 The Brumby Chair Company thrives and moves to Kennesaw Avenue just north of the Marietta Square where it continues in business until 1945. The chair factory is destroyed by fire from cinders from passing locomotives. 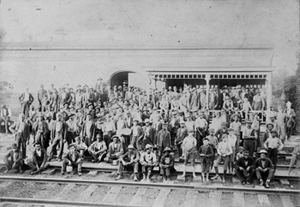 1879 The chair factory is rebuilt with red brick produced on Kennesaw Avenue site to withstand sparks from passing trains of The Western and Atlantic Railroad. The Brumby Rocker, "the commodious and comfortable chair," begins continuous production. The Brumby Chair Company incorporates with capital of $40,000. James Remely Brumby is president and Thomas M. Brumby is secretary-treasurer. 1888 James Remely Brumby, on the advice of his doctors, sells his interest in The Brumby Chair Company to his brother Thomas M. Brumby and retires to Dunedin, Florida. The Brumby Chair Company expands product lines with chair ranging from common cottage pieces to upholstered chairs, but the caned-back and caned-bottom Brumby® Jumbo Rocker is the most popular of all the furniture lines. The Brumby® Jumbo Rocker, now becoming famous for its unique design and great comfort, selling nationally for $4.50 each, is found on porches of large private homes throughout the South and hotel verandahs across the country. Thomas M. Brumby, Jr., eldest son of Thomas M. Brumby, Sr., founder of The Brumby Chair Company, is elected Vice President and General Manager of Brumby Chair Company. Thomas M. Brumby, Jr., named President of Brumby Chair Company succeeding his father who retired due to poor health. Thomas M. "Pappy" Brumby, Sr., age 90, dies March 1 at his Kennesaw Avenue home about a block from the Brumby Chair Company he helped found in 1875. His six sons acted as pallbearers. 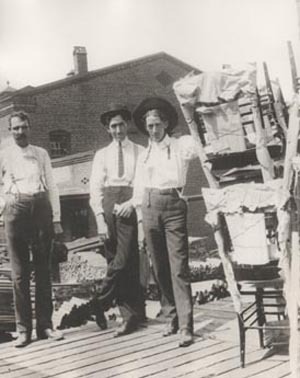 Sarah Blackwell Gober Temple writes in her book, The First Hundred Years, "The Brumby Rockers were enjoyed not only by the older citizens, but by many children who, on pleasant summer nights, have been rocked to sleep in them on wide front porches of Cobb County homes." J.R. Brumby, co-founder of the Brumby Chair Company and founder of Marietta Chair and Table Company, dies at his Dunedin, Florida home six weeks before his 89th birthday. Thomas M. Brumby, Jr., president of the Brumby Chair Company, who was serving his fifth term as mayor of Marietta, dies August 20th. 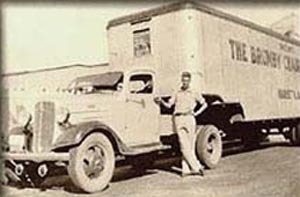 Robert E. Brumby, brother of the late T.M. Brumby, Jr. and one of the six sons of Thomas M. Brumby, Sr., founder of the Brumby Chair Company, is named president of the Brumby Chair Company. Other officers elected in 1938 were Otis A. Brumby, Sr., publisher of the Cobb Country Times, vice president; Remley Brumby, treasurer and T.M. Brumby, III, secretary. The Brumby Chair Company's annual catalog is dedicated to its 350 employees and shows 116 items. 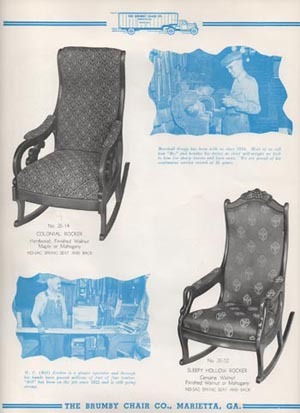 The Brumby Chair Company ceases production of rockers due to inability to obtain cane from the far east and due to labor shortage caused by Bell Aircraft Corporation's locating in Marietta to build B-29 bombers for World War II effort. The Brumby Chair Company, manufacturer of over 150 different lines of furniture during its 70-year history, ceases all furniture manufacturing. Factory sold to Marietta Manufacturing Company that continues to make chairs until 1950. The Brumby family retains ownership of the name Brumby Chair Company and trademark of Brumby® Jumbo Rocker. Records of the Brumby Chair Company are donated to the University of Georgia, Hargrett Library special collection, at the Ilah Little Library on the old main campus. Brumby Chair Company licenses Frank H. Melson, d/b/a/ Accepted Products, Inc., to manufacture and market the Brumby® Jumbo Rocker. Frank H. Melson dies at age 38 of a heart attack before production of the Brumby Rocker can begin. 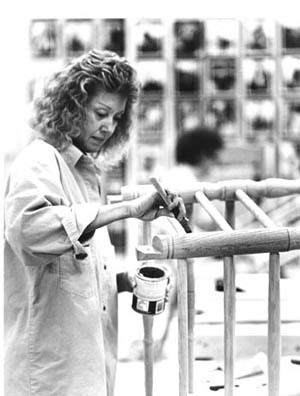 Carole H. Melson fulfills her late husband's dream and manufacturers the first Brumby® Jumbo Rocker since World War II. President Jimmy Carter and First Lady Rosalyn order five Brumby Jumbo Rockers for the Truman Balcony overlooking the ellipse at the White House. United States Commission of Patents and Trademarks issues Brumby family trademark for the "Brumby®" Rocker. The Atlanta High Museum of Art accepts a Brumby Rocker for its, permanent collection as an authentic example of Georgia-made furniture. Carol H. Melson announces plans to discontinue production of the Brumby Rocker due to shortage of Red Oak. Carole H. Melson, licensee of the Brumby® Jumbo Rocker since 1967, ceases production at her plant on White Circle near Kennesaw Mountain. 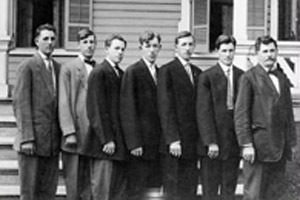 Otis A. Brumby, Jr., a Georgia newspaperman and grandson of Thomas M. Brumby, founder of the Brumby Chair Company, becomes the licensee for the Brumby® Jumbo Rocker and reopens the Brumby Chair Company for manufacturing of the Brumby Jumbo. Otis A. Brumby, Jr. dies after a two year battle with bone cancer and leaves The Brumby Chair Company to his wife Martha Lee Brumby and five children. His eldest daughter Spain Brumby Gregory and youngest daughter Anna P. Brumby take over daily management of The Brumby Chair Company with a commitment to continuing the family tradition that began over 140 years ago.